There is nothing quite like a quick family getaway. A little break to distance yourself from the hustle and bustle of life and just BE.We headed down to The Lensbury to do just that. A luxury and affordable hotel who in the same breath are extremely child friend. A definite recommended hot spots. Here are just some of our highlights. Our stay at The Lensbury came complete with a humming restaurant and bar area found at the front of the building. Friendly staff always up for a conversation and a complex for swimming with a sauna for guests to blow off some steam. There are tennis courts should you wish to try your arm at a bit of luck, coupled with large, modern rooms. 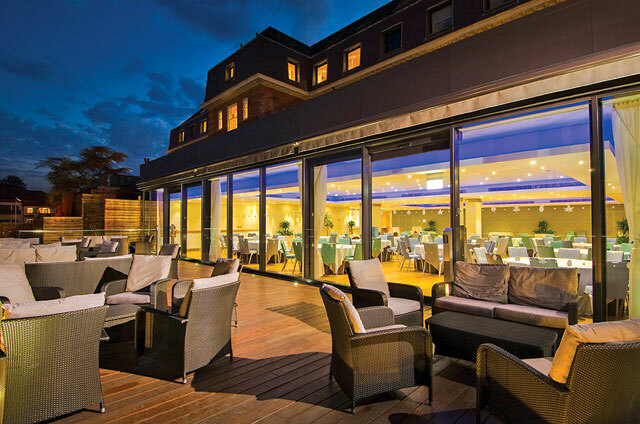 It is hidden within a peaceful part of Twickenham making it the perfect location to relax and unwind. The hotel is perfectly placed within an estate of lovely homes. A peaceful area, which provides a lovely overlook onto greenery and tennis court which looks like a haven within Spain. The site prides itself in offering a vast range of facilities to guests from it’s Spa Centre, Sports Leisure Centre, Wedding Venues to it’s Corporate meeting rooms. Contemporary designs mixed with an older backdrop give the hotel the perfect blend of a contemporary feel and classic details. Décor within the suite was dull but clean – mainly white bathrooms, neutral coloured rooms. The elegant lobby opens up a very classic feel. With swimming pools inside the hotel buried within another complex with sauna, there is an aura of sophistication within the multifaceted hotel. The room was a classic executive suite facing the tennis court and back garden. Luxurious in space and feel, with décor in soft greys and muted browns. The bedding complete with Egyptian cotton sheets, a lounge seating area, a media hub docking station and a Nespresso Coffee Machine. For me no doubt the under floor bathroom heating was a favourite. Everything little detail made you feel right at home. We had our main evening meal at the Dunbar Restaurant prepared by Chef Simon Spreyer. On the menu Wass Cumberland sausages and a seasoned creamy Mash coupled with hands down one of best chicken wings I’ve tasted as a side. They were seasoned through and through to the bone and topping it off with service that came with a smile. In the morning breakfast was served with a large spread buffet. Everything Full English was on the menu. I mean EVERYTHING. From Cumberland sausages, pastries and fresh fruit all to a high standard! An overall great experience and get away for the family! It was great to go somewhere local as new parents, somewhere that was extremely kid friendly and also had an element to luxury to it!